The primary goals of this meeting are to provide you an overview of existing AFS TPM Retail V3, V4 functionality, especially recently released and soon to be released enhancements, to discuss and solicit input regarding future enhancement ideas and priorities, and to facilitate discussion among our clients of best business practices and maximizing value from AFS TPM Retail, both during this meeting and in communications going forward. Recent TPM Retail V3 and V4 enhancements: We’ll demo key enhancements implemented in recent versions to ensure attendees are aware of these features and how to use them. Upcoming AFS TPM Retail V3 and V4 enhancements and future roadmap: We’ll announce and demo enhancements on which we are currently working and which scheduled for upcoming releases. 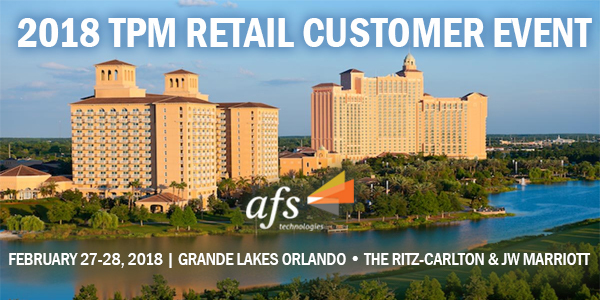 Best practices and getting the greatest possible value from AFS TPM Retail V3 and V4: We’ll discuss best practices that our clients are following to obtain optimal results from TPM management. Peer-to-peer discussion and networking: We’ll provide the opportunity for attendees to share their TPM experiences, challenges and questions with the group. Post-promotion analysis and promotion optimization: We will showcase options, for performing post-promotion analysis and optimizing future promotions. Hope to see you in Orlando, FL on February 27th and 28th. To register, click the button below to email your interest in attending. If you have any questions please contact: Stefanie Cerio at Stefanie.Cerio@afsi.com or 602.424.8765. **Since AFS is providing this conference to you for free, if you cancel after February 12th you agree to be charged the cost AFS incurs for your participation in this event. Amount billed will be $500 per person which will cover food & beverage and event costs. A quick, important note about hotel accommodations. The JW Marriott and Ritz Carlton are both currently sold out on Monday, Tuesday and Wednesday night and our room blocks are full. Some additional nearby options are listed below but rates at these locations are not negotiated by AFS. Stefanie Cerio at Stefanie.Cerio@afsi.com or 602.424.8765.